We have the tools to reskill for the future. Where is the will to use them? By 2030, 210 million people around the world are expected to change occupation. That's equivalent to the current population of Brazil, or 40% of the European Union. Why is this happening? Labour disruption, which is caused by a number of forces including industrialization, globalization, digitization and automation. Up to 800 million workers worldwide are at risk of labour disruption between now and 2030. Not since the automation of agriculture caused 60% of the US and European workforce to move from farms to factories has the global economy been so transformed. But while the transition from agriculture took more than a century, this present wave of change could displace 10% of the world’s workforce in less than 15 years. To adapt, we'll need agile education options to help our workforce reskill. There is a widespread impression that the future will be a frantic race to acquire difficult yet rapidly obsolescing technological skills, and that we'll all need pathways to entirely new jobs sooner rather than later. "From coal miners to data miners” has become shorthand in the US for this idea. Despite the catchy phrase, there are several reasons why such total and ambitious reskilling won't always be the best choice - or even necessary. When a total change of profession is the goal, retraining uses money and time. Some vocational reskilling programs take up to two years. With the average lifespan of a technical skill now down to five years, we need education options that can keep pace with change. So what can we do now to prepare for the future? In most cases, automation won’t take over entire jobs, but parts of them. 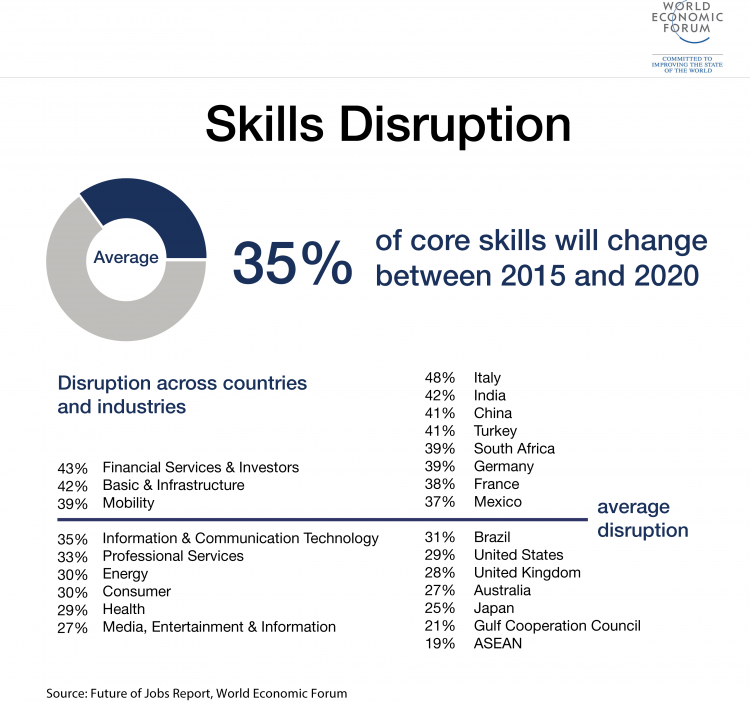 As new digital tools change our work, the skills we use will change too. Consider the librarian who can outsource finding mis-shelved books to a smart robot, and instead spend their time helping students do research. Think of the bank teller who could outsource counting and dispensing cash to an ATM, and focus instead on helping customers understand their finances. In both cases, after routine tasks are automated, the so-called softer skills such as social perceptiveness, problem-solving and teaching become more important. As automation impacts different parts of our companies, we'll need new skills for a workforce which has more time and energy to use them. The challenge will be to match needed skills with the availability of new workers. If we can streamline that process, especially within our own companies, we'll unlock new value and cushion automation's impact on individual workers and their organizations. Recently, great efforts have been made to quantify and standardize credentials, such as degrees, certificates and licences. We'll need to do the same for the skills of the future, especially 'softer' ones which are increasingly important, such as cognitive flexibility, coordination and complex problem-solving. While much of the attention on technology-driven job displacement is focused on automation, many jobs have yet to be transformed by simpler digital tools such as email, spreadsheets, and databases. As the reach of digital tools expands beyond the office, formerly analog roles such as being a car mechanic or home care visitor will become increasingly reliant on digital tools. This change brings tremendous opportunity. But we could be far better prepared to take advantage of it. Basic digital tasks routinely stump up to a third of the population in industrialized countries such as the US, Japan and Germany, according to the OECD. Before we consider cost- and time-intensive programmes for so-called “high” digital skills such as coding, it makes sense to invest in short-term basic digital skills retraining. It will give many people a foothold in the 21st-century economy. Almost 9% of US employees don't have all the skills or qualifications required by their job. That number can be as high as 14% in some parts of Europe. This gap is a problem, but it's also a big educational opportunity. For anybody who wants to stay competitive in the face of new technology, adopting a habit of continuous, self-motivated learning is a way to stay ahead of the curve. You don’t have to become a coder overnight, or even change your profession entirely. But keeping on top of how digital trends are set to change your industry is essential. Fortunately, the very technology that has caused so much disruption can also help us adapt. Learning new skills now takes just a few clicks on a smartphone, tablet or computer. Global enrolment in MOOCs – massive online courses offered by universities and accredited companies - has climbed to record levels over the last six years. Public-private partnerships between companies in need of workers and colleges looking to equip students are increasing. This is a good start. But if we’re going to seize the opportunities that digitization and automation pose, we need to scale up new education methods and adopt new attitudes faster. As individuals, we must take charge of our own learning. Those of us who are in a position to influence policy for the public and private sectors have to create learning opportunities everywhere we can. When it comes to reskilling, we have the tools. We just need the will to use them.